A sparkling spray corsage crystal headpiece which oozes elegance and beauty. Full of 1940s Starlet glamour for weddings or a special occasion. Pretty and delicate, our Leaves of Glamour Headpiece is full of the elegance and beauty of vintage hair accessories from the 1940s. Easy to secure with a petite concord clip, this beautiful design has the characteristics of a spray corsage. 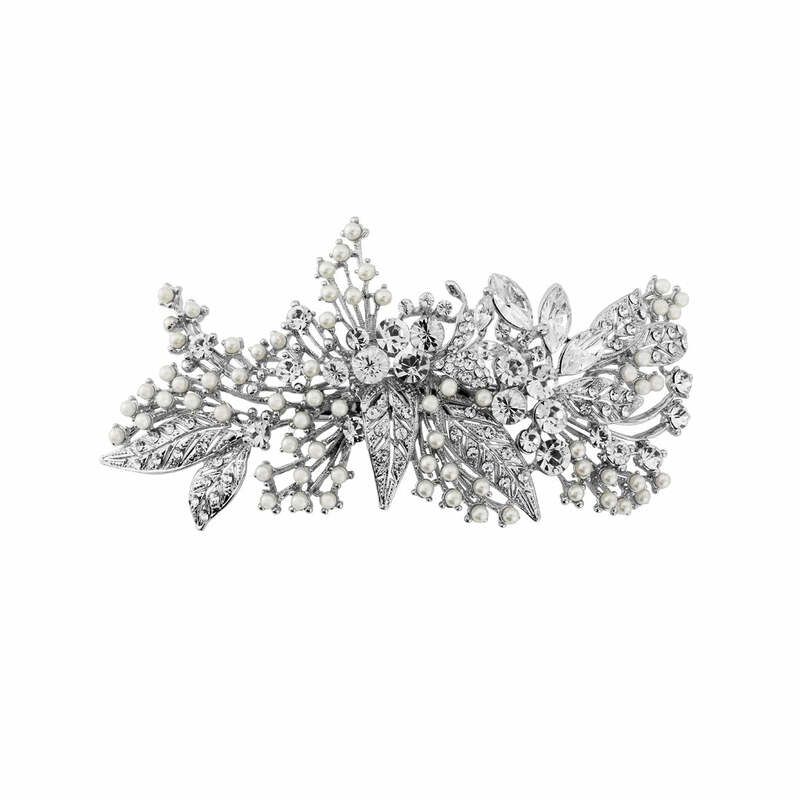 The ivory faux pearl sprays are reminiscent of baby’s breath as they glisten amongst intricate silver tone leaves encrusted with petite clear Austrian crystals creating the most delightful piece. An era where the movie star icons shone, the Forties was known for its extravagance and allure and Leaves of Glamour is certainly not out of place. The perfect accessory for adorning the most elegant side chignon or French pleat, you will certainly be sparkling with Starlet style. Team with a pearl and crystal bangle and a figure hugging floor length gown and you will be ready to glide down that red carpet! 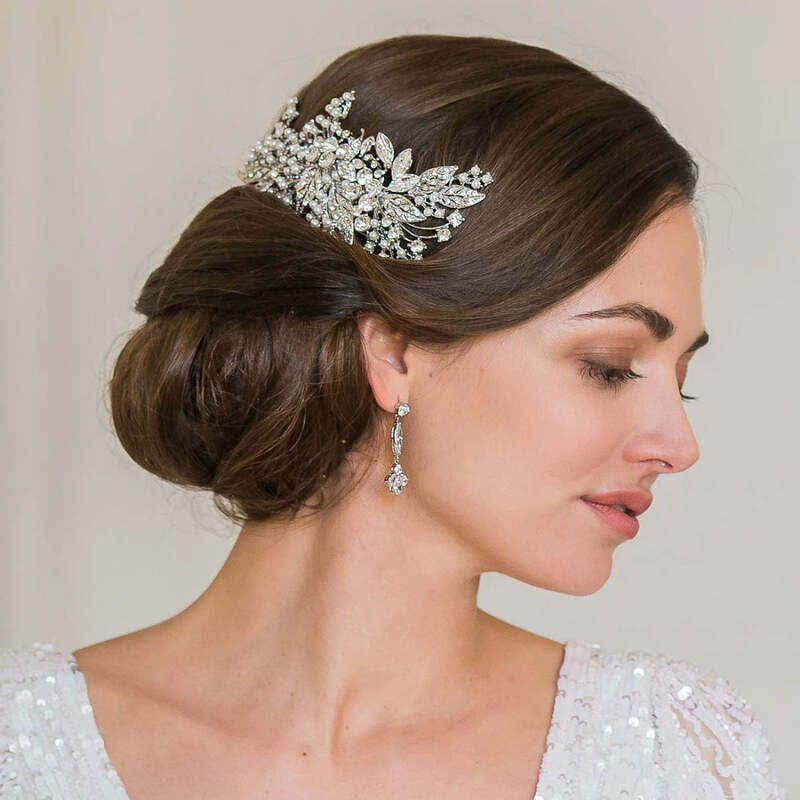 A must have headpiece for brides who favour vintage accessories, this stunning piece would complement almost any wedding dress from a heavily embossed to a slinky satin gown. Add a cascading trailing bouquet and your guests will gasp as you glide down the aisle.